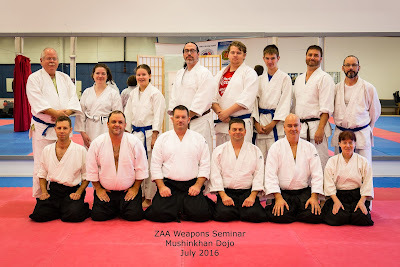 This past weekend we hosted our second Zenshinkai Aikido Association (ZAA) Weapon's Seminar near Cincinnati, Ohio. Mushinkan Dojo sincerely thanks Sensei Noble for training us, the attendees who traveled across states (from New York, West Virginia, and North Carolina), to Master Hamilton and the Ahn Taekwondo Institute for use of the venue, to member "Fireman Dave" for donating lunch from Honey Bake Ham (Yum! ), and to Heidi Lindberg for capturing photographs (link to Google Cloud Drive folder with lots of photos ). Looking forward to future seminars!